Chapter 1 describes the aim of the study. In about half of the patients who undergo (successful) surgical treatment for colorectal cancer, metastases to the liver are encountered during or after the operation. Application of external radiotherapy or chemotherapy only has a palliative effect, mainly due to the restrictions of side-effects. Newer therapies, such as cryosurgery and brachytherapy, are often applied to inoperable metastases and they appear to have a favourable effect on survival. At present, various treatment options are receiving consideration, such as radiofrequency ablation, laser-induced thermotherapy, gene therapy and monoclonal antibodies with or without radioactive labelling. The only treatment for metastases to the liver that has any chance of curing the patient is surgical resection. About 30% of the patients with metastases are eligible for surgical treatment. Five-year survival in these patients is 30-40%. In many of the patients who are candidates for surgical resection of the metastases, it is difficult to achieve completely tumour-free excision margins. These patients have the highest risk of tumour recurrence in the liver. With the aid of radiotherapy, it is possible to fight the tumour tissue that is left in situ at the surgical margins. External radiotherapy is laborious owing to the high risk of radiation damage to the liver and other sensitive tissues in the region of the liver, such as the intestines. Intraoperative radiotherapy (IORT) comprises the irradiation of the surgical margins with a single high dose of radiation directly following tumour excision. The great advantage of IORT is that the radiation dose can be given at precisely the desired location, while shielding any adjacent sensitive structures. Presently, it is not clear how liver tissue reacts to a single high dose of radiation. It is obviously not the intention to seriously damage the remaining liver tissue or cause healing deficits or abscess formation that would threaten organ function. 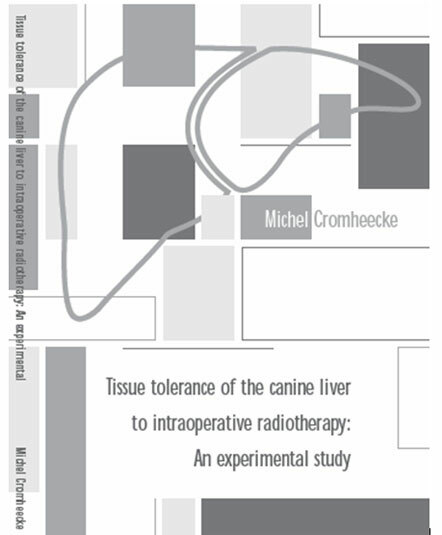 This thesis describes an animal study on the damage that occurs after a single high dose of radiation to normal liver tissue and surgically manipulated liver tissue. The animal model used appeared to be suitable for translation to the human situation. Chapter 2 describes the basic principles of radiobiology. The effect of exposure to radiation depends on the type of radiation (in this study: electrons) and the energy. During the application of radiotherapy, it is necessary to find a balance between fighting the tumour and causing as little damage as possible to the healthy tissues. Each tissue type reacts differently to radiotherapy. In the case of healthy tissues, the response depends strongly on the rate of cell division. The faster a cell divides, the greater its radio sensitivity. The type of tissue also plays an important role and this chiefly concerns tissue function (read: organ). In addition, attention should be paid to the exposure volume: if even a very small part of the spinal cord is irradiated, total paralysis can occur. In contrast, parenchymal organs such as the liver usually have sufficient remaining capacity. However, radiotherapy after surgical resection might reduce the remaining capacity drastically. Characteristic differences in radio sensitivity exist between normal tissue and tumour tissue. Radiobiology makes use of these differences to kill a maximum number of tumour cells while causing the least possible damage to the healthy tissues. By dividing the total radiation dose into small fractions (fractionation) and by applying the fractions over a number of weeks, the highest possible dose can be given with the smallest possible damage to healthy tissues. Owing to the fact that the IORT treatment field does not include healthy tissues, a high dose can be given in one session. The liver is composed of connective tissue, blood vessels, bile ducts and specialised cells (hepatocytes) that are responsible for e.g. removing waste products from the blood and excreting them from the body in the form of bile via the intestines. All these structures have their own individual radio sensitivity. Hepatocytes can be killed directly by irradiation, or they can die during cell division, or die indirectly at a later date as a result of damage to the connective tissue and blood vessels. Particularly regarding the late effects of radiation damage, it is unclear what the influence is of the single high dose used in this study. In Chapter 3, the development and application of IORT are described IORT is the application of a single high dose of (electron) radiation to an operatively exposed tumour or the surgical margins after tumour resection during an elective surgical procedure. Although the biological effectiveness (RBE) of a single does is greater than that of fractionated therapy, the advantages of IORT are not so much based on radiobiological principles (see Chapter 2) as on physical principles: the irradiation can be applied very accurately and healthy tissues can be excluded from the treatment field. IORT can also play a role in the treatment of tumour recurrence after conventional radiotherapy, because IORT spares earlier irradiated normal tissues.In 1907, 12 years after the discovery of X-rays, the first description of IORT was published in connection with an inoperable stomach tumour. A historical overview is given of the development of radiotherapy from the first treatment for skin diseases with X-rays, to the current wide-ranging applications, such as external radiotherapy with 3-dimensional planning, brachytherapy, radioactive labelled antibodies and IORT. It speaks for itself that the results of animal experiments and clinical studies in combination with rapid technological progress have increased the capacity of radiotherapy over the past 100 years. In the period from 1964 to 1976, the first clinical studies were performed in Japan on patients treated with IORT. Soon afterwards, studies were performed in the US, Spain and Germany. Since 1986, IORT has been used in clinical studies in the Netherlands (Groningen, Eindhoven) mainly for colorectal cancer. In many cases, a combination of surgery, external radiotherapy and IORT was used. These clinical studies were preceded by extensive animal experiments on the sensitivity of various tissues and organs to a single high dose of radiotherapy. The dog proved to be a reliable and comparable animal model to translate the results to the human situation. At present, IORT is being applied to e.g. gastrointestinal tumours, breast cancer, sarcomas, pancreatic and biliary tumours and head and neck tumours. Although various studies have indicated a positive effect on survival in gastrointestinal cancer patients, similar effects have not yet been proven at other locations. Well-known problems are the difficulty of setting up prospective randomised trials and the need for multicentre studies: only a few centres are able to apply IORT, owing to the need for large infrastructural investments. Chapter 4 describes the current treatment for colorectal liver metastases. The only treatment for liver metastases that has a chance of curing the patient is surgical resection. Increasing experience and improved diagnostics, indications, surgical techniques and perioperative care have resulted in a 5-year survival rate of 21 to 48%. Nevertheless only 25% of patients with liver metastases are suitable candidates for surgical treatment. Patient selection is extremely important in the decision of whether or not to perform surgical excision of liver metastases. Prognostic factors in the surgical treatment for liver metastases chiefly concern: number and size of the metastases, metastases outside the liver and the width of the tumour-free surgical margins. Treatment for liver metastases with chemotherapy, whether or not in combination with other treatment forms, still only has a palliative effect. Studies on different combinations of antitumour therapies applied according to different protocols showed no more than slight improvement in survival. One of the limiting factors was the severe side-effects of chemotherapy for the patient. Experimental techniques for the administration of antitumour medication, such as isolated liver perfusion or labelled antibodies, may help to solve this problem. Tailored direct treatment for metastases, such as freezing (cryotherapy) or destroying them by means of heat (radiofrequency ablation and laser-induced thermotherapy), seems to have a favourable effect on inoperable metastases, although at present there are insufficient data. Despite improved techniques, conventional radiotherapy in the form of external irradiation only has palliative value owing to the high risk of damage to normal tissues. Other treatment strategies that make use of radiation are currently under study. These include remote afterloading interstitial (Ir 192) radiotherapy, radioactive implants, the use of radioactive labelled antibodies and selective embolisation by means of radioactive colloids. Chapter 5 gives an overview of current knowledge on radiation damage to the liver. Animal studies and clinical studies have shown that the radio sensitivity of the liver varies depending on the physical parameters of the radiation, such as type of irradiation, dose, fractionation and treatment volume. In addition, the physical status of the patient and his/her liver are of importance. The use of toxic medication and surgery to the liver lead to greater radio sensitivity. In patients, radiation damage is chiefly expressed in a specific type of liver inflammation that can recover or ultimately cause organ failure. Generally, it can be concluded that fractionated radiotherapy (maximal 3 Gy fractions) with a total dose of 30 Gy can be applied to the whole liver without any clear functional damage. Chapter 6 describes the experimental animal model used in this study. Previous tissue tolerance studies have shown that the dog as experimental animal is a reliable model, because the technical procedure can be translated accurately to the human situation owing to the size of the animal. Structural and histological similarities between the canine liver and the human liver mean that the outcomes of this study can be used for clinical application. A group of 25 beagles were divided into 5 subgroups based on the radiation dose received. Each animal underwent laparotomy and partial liver lobe resection (about 5% of the total volume). Haemostasis of the surgical margins was achieved using an experimental technique with compression stitches. In the same session, the surgical margins and the non-surgically manipulated liver lobe were irradiated using a Linear Accelerator (electron energy 10 MeV) with 10 Gy, 20 Gy, 25 Gy or 30 Gy. In each subgroup, one animal served as a control by undergoing the total surgical and irradiation procedure with a dose of 0 Gy. The radiation was applied accurately to the desired location on the liver (the left lobe) using a special tube fitted to the linear accelerator. Lead shielding was used to exclude adjacent structures from the treatment volume, e.g. intestines and pancreas. Medical files were kept on the experimental animals and blood tests were performed regularly. After 3 months, 1 year, 2 years, 3 years and 5 years, animals were killed to obtain macroscopic, electron microscopic and histopathological data on the liver and adjacent structures. Chapter 7 presents the results at 1-year follow-up. The combined surgical and irradiation procedures were conducted satisfactorily. During the follow-up period of 1 year, the experimental animals survived the treatment well. Only one animal developed superficial wound infection, which responded to antibiotic treatment. Blood tests showed that in the majority of animals, the haemoglobin value decreased postoperatively, but the values remained within the normal range and normalised to the preoperative levels within 3 weeks. During the first 6 weeks after the operation, alkaline phosphatase increased in some cases to 10 times the normal value. This parameter for hepatocyte damage was not dose-dependent: the control group also showed increased levels. Within 6 months, the values had normalised. It is probable that the increases were more the result of partial liver resection than the radiotherapy. No further liver function disturbances were observed. At 3 months and at 1 year, one animal in each dosage group was killed for evaluation. It appeared that the resection margin of the liver had adhered to the peritoneum and there was considerable fibrosis (scar tissue). After 3 months, the radiotherapy site showed a grey area, which under the microscope proved to be thickening of the liver capsule. After 1 year follow- up, this was characterised by a local defect in the liver tissue in combination with severe fibrosis. These findings were even observed after the lowest dose of 10 Gy. No abnormalities were found in the other abdominal organs. Histopathological changes were present, such as interstitial fibrosis, hepatocyte atrophy, biliary duct proliferation and an inflammatory reaction of the parenchyma. These abnormalities increased with time and with the size of the radiation dose; after 1 year, only the parenchymal inflammatory reaction had disappeared. Electron microscopic examination after 1 year showed interstitial fibrosis of the parenchyma just beneath the capsule and balloon-shaped abnormal hepatocytes in the irradiated area. No relation could be established with the radiation dose applied. It could be concluded that in this animal model, intraoperative radiotherapy of the liver was easily feasible without any perioperative complications. Very little histological damage was visible after 3 months, except for one parenchymal inflammatory reaction, which suggested high resistance in the short-term. However, after 1 year, severe parenchymal abnormalities were found within the irradiated area. Chapter 8 presents the results of scintigraphy that aimed to detect and monitor possible liver damage in a non-invasive manner. Radioactive technetium-labelled (isotope: 99mTC) sulphur colloid was injected intravenously and absorbed selectively by the Kupffer cells. Any poorly functioning Kupffer cells will show poor technetium absorption. Graphic images of the liver were obtained using a gamma camera. Areas with decreased absorption were visible as less intense areas on the scans and a scoring system was applied. Liver scans were performed preoperatively and at 1, 3 and 6 weeks postoperatively and repeated at regular intervals during follow-up. The liver scans were judged for decreased or absent (shrivelled) absorption capacity, changes in size (enlargement) of the irradiated area. An independent nuclear medicine specialist read the scans. The abnormalities on the scans were poorly correlated with the abnormalities found at autopsy. Absent or decreased absorption in the long-term were the only features that appeared to be consistently dose-dependent. Possible explanations were that the target area was relatively small compared to the total volume of the liver and the abnormalities were located in the periphery. In addition, movement artefacts due to respiration may have hindered reliable interpretation. Chapter 9 presents the long-term results of the study. All the experimental animals remained in good physical condition to the end of follow-up. At 2 years, 3 years and 5 years after the IORT procedure, the remaining subgroups were killed for histopathological evaluation. It was striking that after 2 years, the macroscopic defect was smaller and at 5 years, it had almost disappeared. Microscopic examination showed that the thickening of the capsule in the short-term had decreased, but that the subcapsular fibrosis had increased. Biliary duct proliferation and hepatocyte atrophy had decreased. A characteristic finding was arteriolar changes, such as endothelial proliferation and (after 5 years) focal hyalinosis with stenosis of the lumen. Periportal fibrosis that led to bridging was maximal after 2 and 3 years, but had decreased after 5 years. A clear border could be distinguished between fibrotic parenchyma and normal parenchyma. After partial liver resection in this animal model, it proved to be technically feasible to apply a single high dose of electron radiation to the resection margins and to an area of the normal liver. During a follow-up of 5 years, there were no cases of treatment-dependent morbidity or mortality in our experimental animals. Short-term and long-term radiation damage was considerable. It was initially expressed in the form of hepatocyte atrophy and biliary duct proliferation and later expressed in parenchymal fibrosis and after 5 years, in portal vein abnormalities. In view of the results of this study and previous animal experiments using IORT, this animal model seems to be suitable for translation to the clinical situation. The incidence of colorectal carcinoma is still increasing. About 50 - 70% of the patients develop local recurrence or metastases to the liver and/or lungs. During many years of clinical application to treat local recurrence, the combination of surgical resection and IORT has proved to have favourable results in randomised studies. It has not yet been clearly established whether IORT also has favourable effects on survival on other malignancies, such as pancreas carcinoma and gastric carcinoma although local tumour control seems to be improved. One of the reasons for this is that adequate studies are lacking. Possibilities for the application of IORT seem to regard the treatment of breast cancer. Future treatment of breast cancer could consist of lumpectomy and a sentinel node procedure followed by intraoperative radiotherapy of the biopsy site without adjuvant external beam irradiation of the whole breast. Local treatment for liver metastases does not offer a solution for a disease that disseminates haematogenically. Only 30% of the patients with colorectal metastases to the liver are suitable candidates for resection. High recurrence rates in and outside the liver mean that adjuvant treatment is necessary. Systemic and regional chemotherapy have palliative value alone or lead to slight benefit in combination with surgery. Precise targeting of the radiation beam in new external radiotherapy techniques has successfully decreased the risk of damage to healthy tissues. New local and systemic treatment approaches became recently available. A new systemic treatment approach is the so called “targeted therapy”; a combination treatment of an antibody against epidermal growth factor-receptor (EGF-R, cetuximab) and a vascular endothelial growth factor (VEGF, bevacizumab) both in combination with chemotherapy. Farmacogenetics might also play a role in the near future in the selection of patients who are candidates for a specific chemotherapy treatment. Cryosurgery of liver metastases has not yielded the desired results. Radiofrequency ablation seems promising, but is so far chiefly useful as local (palliative) treatment for inoperable metastases. Surgical resection of liver metastases, with or without RFA, in case of marginal resection, combined with precise target radiation treatment, as well as the use of new regional or systemic chemotherapy approaches might alter the disease outcome. The final goal of the combined treatment approaches in the fight against metastatic colorectal cancer to the liver is reducing local and distant failure and therefore improving disease free and overall survival. Ongeveer de helft van de patiënten die een (succesvolle) chirurgische behandeling voor coloncarcinoom ondergaan worden tijdens of na de operatie geconfronteerd met uitzaaiingen naar de lever. Behandeling hiervan met zowel uitwendige bestraling als chemotherapie heeft met name door de beperkende bijwerkingen slechts een palliatief resultaat. Nieuwere behandelingen zoals cryochirurgie en brachytherapie worden toegepast voor uitzaaiingen die niet chirurgisch behandeld kunnen worden en lijken een gunstig effect op overleving te hebben. Op dit moment worden behandelingsopties dmv radiofrequente stroom, door laser opgewekte warmte, monoclonale antilichamen al of niet radioactief gelabeld, en gentherapie onderzocht. De enige behandeling van uitzaaiingen naar de lever die een kans op genezing geeft is de chirurgische verwijdering hiervan. Ongeveer 30% van de patiënten met uitzaaiingen komt hiervoor in aanmerking. De 5-jaarsoverleving van deze groep is ongeveer 30-40%. Het blijkt dat van de patiënten die in aanmerking komen voor chirurgische verwijdering van de uitzaaiing(en) het vaak moeilijk is om het snijvlak volledig en ruim tumorvrij te krijgen. Deze groep patiënten heeft de grootste kans op terugkeer van de tumor in de lever. Met behulp van radiotherapie is mogelijk om het tumorweefsel dat in het snijvlak wordt achtergelaten te bestrijden. Uitwendige bestraling is moeizaam in verband met de grote kans op bestralingsschade van de lever en gevoelige weefsels rondom de lever zoals de darmen. Intra Operatieve Radio Therapie (IORT) is het bestralen van chirurgische snijvlakken met een eenmalige hoge dosis straling aansluitend op de tumorverwijdering. Het grote voordeel hiervan is dat de dosis straling precies op de gewenste plaats gegeven kan worden waarbij kwetsbare structuren worden afgeschermd. Het is echter niet bekend hoe het leverweefsel reageert op een eenmalige hoge dosis straling. Het is natuurlijk niet de bedoeling dat het resterende leverweefsel hierdoor ernstig beschadigd wordt er genezingsstoornissen of abcesvorming optreedt zodanig dat het resterende leverweefsel niet meer voldoende functioneert. In hoofdstuk 2 worden basale principes van de radiobiologie besproken. Het effect van straling hangt mede af van het type straling (in dit onderzoek: elektronen straling) en de energie hiervan. Er dient bij bestraling een evenwicht gevonden te worden tussen aan de ene kant het bestrijden van de tumor en aan de andere kant het zo weinig mogelijk ontstaan van schade aan gezonde weefsels. Elk weefsel reageert anders op bestraling. Voor gezonde weefsels hangt dit in grote mate samen met de snelheid van deling van de cellen waaruit het weefsel is opgebouwd. Hoe vaker er celdeling plaatsvindt hoe groter de gevoeligheid. Ook het soort weefsel is van belang dit heeft met name met de functie van de verschillende weefsels (lees: organen) te maken. Tevens maakt het uit hoe groot het bestraalde volume is: als er een klein gedeelte van het ruggenmerg wordt bestraald kan de functie volledig uitvallen, voor parenchymateuze organen zoals de lever bestaat er dan nog voldoende restcapaciteit. Bij bestraling na chirurgische resectie kan deze restcapaciteit overigens alsnog tekort schieten. Tussen normaal weefsel en tumorweefsel bestaan typische verschillen in stralingsgevoeligheid. De radiobiologie maakt gebruik van deze verschillen om zoveel mogelijk tumor te doden waarbij zo min mogelijk schade aan gezonde weefsels optreedt. Door de totale bestralingsdosis te verdelen in kleine stukjes (fractioneren) en deze gedurende enkele weken te geven kan er een zo hoog mogelijke dosis gegeven worden met zo weinig mogelijk schade aan gezonde weefsels. Daar bij IORT gezonde weefsels buiten het bestralingsgebied gehouden kunnen worden kan de hoge dosis in één keer gegeven worden. De lever is opgebouwd uit bindweefsel, bloedvaten, galgangen en gespecialiseerde cellen (hepatocyten) die onder meer afvalstoffen uit het bloed halen en deze via de vorming van gal in de darmen terecht laten komen om het lichaam te verlaten. Al deze structuren hebben hun individuele stralingsgevoeligheid. Hepatocyten kunnen na een dosis straling direct doodgaan, doodgaan op het moment dat ze delen of indirect na langere tijd doodgaan ten gevolge van het optreden van schade aan het bindweefsel en bloedvaten. Vooral voor wat betreft deze late stralingschade is onduidelijk wat voor invloed de in dit onderzoek gebruikte eenmalige hoge doses hebben. In hoofdstuk 3 wordt de ontwikkeling en toepassing van IORT beschreven IORT is het geven van een eenmalige hoge dosis (elektronen) straling op een operatief vrijgelegde tumor of het sneevlak na resectie hiervan tijdens een geplande operatieve procedure. Hoewel de biologische effectiviteit (RBE) voor een eenmalige dosis groter dan voor gefractioneerde therapie zijn de voordelen van IORT zijn niet zozeer gebaseerd op radiobiologische principes (zie hoofdstuk 2) maar op fysische principes: de bestraling kan zeer nauwkeurig gegeven worden en gezonde normale weefsels kunnen uit het bestralingsveld gehouden worden. IORT kan tevens een rol spelen bij de behandeling van recidief tumor na conventionele radiotherapie omdat IORT eerder bestraalde normale weefsels spaart. In 1907, 12 jaar na de ontdekking van Röntgenstralen, werd voor het eerst een behandeling dmv IORT beschreven, in dit geval een niet chirurgisch te verwijderen maagtumor. Een historisch overzicht wordt gegeven van de ontwikkeling van de radiotherapie vanaf de eerste behandeling van huidafwijkingen met Röntgenstralen tot de huidige verschillende toepassingen zoals: externe bestraling met 3-dimensionele planning, brachytherapie, radioactief gelabelde antilichamen en IORT. Het spreekt voor zich dat zowel de resultaten van dierexperimentele, -als klinische studies in combinatie met een snel voortschrijdende technische ontwikkeling de mogelijkheden van radiotherapie de afgelopen eeuw heeft doen toenemen. In de periode 1964–1976 werden vanuit Japan de eerste klinische studies beschreven van patiënten behandeld dmv IORT. Al snel volgden studies uit de Verenigde Staten, Spanje en Duitsland. Vanaf 1986 werd IORT in klinische studies in Nederland (Groningen, Eindhoven) toegepast bij de behandeling van vooral rectumcarcinoom. Vaak werd hierbij een combinatie toegepast van chirurgie, externe bestraling en IORT. Deze klinische studies werden voorafgegaan door uitgebreide dierexperimentele studies naar de gevoeligheid van de verschillende weefsels en organen voor een eenmalige hoge dosis radiotherapie waarbij de hond een betrouwbaar en vergelijkbaar diermodel bleek te zijn om resultaten naar de humane situatie te vertalen. Op dit moment wordt IORT klinische toegepast voor o.a. gastrointestinale tumoren, mammacarcinoom, sarcomen, tumoren van het pancreas en de galwegen en hoofd-hals tumoren. Hoewel uit diverse studies is gebleken dat bij gastrointestinale carcinomen (of recidief hiervan) IORT een gunstig effect heeft op de overleving dient dit voor de overige locaties nog aangetoond te worden. Een bekend probleem is het opzetten van prospectieve gerandomiseerde studies en de noodzaak van multicentred studies hierbij: slechts in weinig centra bestaat de mogelijkheid voor het toepassen van IORT daar deze grote infrastructurele investeringen vergt. In hoofdstuk 4 wordt de huidige behandeling van colorectale levermetastasen Beschreven. De enige behandeling van uitzaaiingen naar de lever die een kans op genezing geeft is de chirurgische verwijdering hiervan. Toenemende ervaring en een verbetering van zowel diagnostiek, indicatiestelling, operatieve technieken, en perioperatieve zorg hebben geresulteerd in een 5-jaars overleving van 21 tot 48%. Desondanks komt slechts 25% van patiënten met uitzaaiingen naar de lever voor chirurgische behandeling in aanmerking. Patiënten selectie is uitermate belangrijk in de beslissing tot chirurgische behandeling van levermetastasen. Prognostische factoren bij de chirurgische behandeling van uitzaaiingen naar de lever zijn met name: aantal en grootte van de uitzaaiingen, uitzaaiingen buiten de lever en de tumorvrije marge van het snijvlak. De behandeling van uitzaaiingen naar de lever met behulp van chemotherapie al of niet in combinatie met andere behandelingen is nog steeds van palliatieve aard. Studies met verschillende combinaties van antitumormiddelen op verschillende manieren toegepast lijken slechts een geringe verbetering in overleving te geven. Een beperkende factor hierbij betreft de belastende bijwerkingen van chemotherapie voor de patiënt. Experimentele technieken voor het toedienen van anti-tumormiddelen zoals via geïsoleerde leverperfusie of via gelabelde antilichamen zouden dit moeten ondervangen. Gerichte directe behandeling van de uitzaaiingen zoals het bevriezen hiervan (cryotherapie) of vernietiging dmv warmte (radiofrequency ablation en laser induced thermotherapy) lijken in geval van niet chirurgisch verwijderbare metastasen een gunstig effect te hebben doch het ontbreekt nog aan voldoende gegevens. Conventionele radiotherapie in de vorm van uitwendige bestraling heeft, in verband met de grote kans op normale weefselschade, ondanks verbeterde technieken nog altijd alleen palliatieve waarde. Andere behandelingsstrategieën die gebruik maken van radioactieve straling zijn onderwerp van onderzoek. Het betreft hier remote afterloading interstitial (Ir‑192) radiation therapy, radioactieve implantaten, het gebruik van radioactief gelabelde antilichamen en selectieve embolisatie dmv radioactieve bolletjes. Hoofdstuk 5 geeft een overzicht van wat er tot op heden bekend is met betrekking tot stralingsschade aan de lever. Uit zowel dierexperimentele als klinische studies blijkt dat ook de gevoeligheid van de lever voor straling varieert afhankelijk van de fysische parameters van de gebruikte straling zoals, type straling, dosis, fractionering en het bestraalde volume. Verder is tevens de conditie van zowel de patiënt als zijn of haar lever van belang. Het gebruik van toxische medicamenten en leverchirurgie hebben een grotere stralingsgevoeligheid ten gevolge. Bij patiënten uit bestralingschade zich voornamelijk door een specifiek soort leverontsteking welke kan herstellen of uiteindelijk kan leiden tot leverfalen. Algemeen kan geconcludeerd worden dat gefractioneerde bestraling met een totale dosis tot 35 Gy op de hele lever gegeven kan worden zonder duidelijke functionele schade. In hoofdstuk 6 wordt het dierexperimentele model waarop het onderzoek is gebaseerd beschreven Uit eerder weefseltolerantie studies is gebleken dat de hond als proefdier een betrouwbaar model is daar door de grootte van het proefdier met name de onderzochte (technische) procedure goed vertaald kan worden naar de humane situatie. De structurele en histologische overeenkomst tussen de lever van de hond en de mens maakt het mogelijk om de uitkomsten van dit onderzoek als richtlijn te gebruiken bij een eventuele klinische toepassing. Een groep van 25 Beagles werd op basis van te ontvangen bestralingsdosis verdeeld in 5 subgroepen. In deze subgroep werd bij ieder proefdier een laparotomie verricht waarbij een partiele leverkwabresectie (ongeveer 5% van het totale volume) werd verricht. Hemostase van het sneevlak werd verkregen dmv van een experimentele techniek met compressie hechtingen. Aansluitend werd zowel het sneevlak als een niet chirurgisch behandelde leverkwab bestraald met behulp van een Lineaire Versneller (elektronenstraling:energie 10 MeV) waarbij de proefdieren respectievelijk 10 Gy, 20 Gy, 25 Gy en 30 Gy ontvingen. Tevens functioneerde in elke subgroep een proefdier als controle. Deze onderging wel de gehele chirurgische en bestralingsprocedure maar er werd een dosis van 0 Gy gegeven. De bestraling werd precies op de gewenste plaats op de lever (de linker leverkwab) gegeven dmv een speciale buis die gekoppeld was aan de Versneller. Door middel van loodplaatjes werden omgevende structuren als darmen en pancreas beschermd tegen straling. Er werd een medisch dossier van de proefdieren bijgehouden en er vond regelmatig bloedonderzoek plaats. Na respectievelijk 3 maanden, 1 jaar, 2 jaar, 3 jaar en 5 jaar werden de dieren opgeofferd om de lever en omliggende structuren zowel macroscopisch, elektronenmicroscopisch als histopathologisch te onderzoeken. In hoofdstuk 7 worden de resultaten weergegeven na een follow-up van 1 jaar. De gecombineerde chirurgische en bestralingsprocedure was technisch goed verlopen. Tijdens een follow up van 1 jaar bleek dat de proefdieren de toegepaste behandeling goed hadden doorstaan. Slechts bij 1 proefdier werd een oppervlakkig wondinfect geconstateerd welke goed reageerde op antibiotische behandeling. Bloedonderzoek liet zien dat er postoperatief bij de meeste proefdieren een verlaagd hemoglobine liet zien welke echter binnen de normaalwaarden bleef en binnen 3 weken normaliseerde naar preoperatieve waarden. Gedurende de eerste 6 weken na de operatie steeg het alkalisch fosfatase naar soms 10-voudige waarden. Deze parameter voor levercelbeschadiging was echter niet dosisafhankelijk: ook de controlegroep liet een stijging zien. Binnen 6 maanden waren de waarden genormaliseerd. Waarschijnlijk was de stijging het gevolg van de partiele leverresectie en minder van de bestraling. Leverfunctiestoornissen konden verder niet worden vastgesteld. Na 3 maanden en 1 jaar vond terminatie en obductie plaats van 1 hond uit elke dosisgroep. Het bleek dat het resectievlak van de lever was vergroeid met het peritoneum en veel fibrose (littekenweefsel) vertoonde. De plaats van bestraling liet bij 3 maanden een grijze vlek zien welke onder de microscoop overeenkwam met een verdikking van het leverkapsel. Bij 1 jaar follow up was dit gekenmerkt door een lokaal defect in het leverweefsel, gepaard gaande met ernstige fibrose. Dit trad al op na doses van 10 Gy. De overige organen in de buik toonden geen afwijkingen. Tevens werden histopathologische veranderingen waargenomen als: interstitiele fibrose, levercel atrofie, galgangproliferatie en een ontstekingsreactie van het parenchym. Deze afwijkingen namen zowel toe in tijd als met toenemende dosis; alleen de parenchymale ontstekingsreactie werd na 1 jaar niet meer teruggezien. Elektronenmicroscopisch onderzoek uitgevoerd na 1 jaar liet de interstitiele fibrosering van het parenchym net onder het kapsel zien en ballonvormige afwijkende hepatocyten in het bestraalde gebied een relatie met de gegeven dosis kon echter niet worden vastgesteld. Geconcludeerd kan worden dat intraoperatieve radiotherapie van de lever in dit model technisch goed uitgevoerd kon worden zonder perioperatieve complicaties. Hoewel na 3 maanden, behalve een parenchymale inflammatoire reactie, weinig histologische schade werd geconstateerd en dit dus een hoge resistentie op korte termijn suggereert, werden na 1 jaar forse parenchymale afwijkingen gevonden binnen het bestraalde gebied. Hoofdstuk 8 laat de resultaten zien van scintigrafisch onderzoek bedoeld om de mogelijk ontstane leverschade niet-invasief vast te leggen en te vervolgen Radioactief gelabeld Technetium (isotoop: 99mTc-sulfur- colloid) wordt intraveneus geïnjecteerd en vervolgens selectief door de Kupffercellen opgenomen. Indien de Kupffercellen niet goed werken nemen deze minder of geen Technetium op. Een grafisch beeld kan hiervan worden geproduceerd door een Gamma-camera die de door het proefdier (i.c. de lever) uitgezonden straling opvangt. Gebieden met verminderde opname zijn te zien als gebieden met verminderde intensiteit op het beeld waaraan en scoringssysteem werd gekoppeld. Deze isotopenscan werd preoperatief en 1, 3 en 6 weken postoperatief en regelmatig daarna herhaald. De verkregen opnamen werden beoordeeld op: verminderde (“decreased”) of afwezige (“shriveling”) opnamecapaciteit, verandering van grootte (“enlargement”) van het bestraalde gebied. De scans werden “blind” beoordeeld door een nucleair geneeskundige. Het bleek dat de afwijkingen op de scans slechts moeizaam correspondeerden met de afwijkingen gevonden bij autopsie. Slechts afwezige of verminderde opname op langere termijn leek consistent en dosisafhankelijk te zijn. Een verklaring zou kunnen zijn dat het om relatief kleine gebieden ging ten opzichte van het totale levervolume en dat de afwijkingen aan de rand van de lever lagen. Ook artefacten ten gevolge van beweging van de lever door de ademhaling kunnen een betrouwbare interpretatie in de weg gestaan hebben. Hoofdstuk 9 geeft de lange-termijnresultaten weer van het onderzoek. Alle proefdieren bleven tot het einde van de follow up in goede conditie. Op de tijdstippen 2 jaar, 3 jaar en 5 jaar na de IORT-procedure werden de overige subgroepen opgeofferd voor histopathologisch onderzoek. Opvallend was dat na 2 jaar het macroscopische defect kleiner was geworden en na 5 jaar praktisch verdwenen. Microscopisch bleek dat de op korte termijn vastgestelde kapselverdikking was afgenomen maar de fibrosering subcapsulair sterk was toegenomen. Galgangproliferatie en levercelatrofie waren verminderd. Kenmerkend was het optreden van portale arteriolaire veranderingen zoals endotheliale proliferatie en (na 5 jaar) focale hyalinose met vernauwing van het lumen. Periportale fibrose leidend tot “bridging” fibrosis was maximaal na 2 en 3 jaar en was bij 5 jaar follow up weer afgenomen. Een duidelijke grens was te onderscheiden tussen het fibrotische parenchym en normaal parenchym. Het blijkt dat het geven van een eenmalige hoge dosis elektronenstraling op zowel het resectievlak na partiële leverresectie als op een normaal gedeelte van dezelfde lever in dit diermodel technisch goed uitvoerbaar is. Gedurende 5 jaar follow up was er geen behandelingsafhankelijke morbiditeit of mortaliteit in de onderzoeksgroep opgetreden. Zowel korte termijn als late termijn bestralingsschade was aanzienlijk en uitte zich met in eerste instantie in levercelatrofie en galgangproliferatie, later in parenchymale fibrose en na 5 jaar in portale vasculaire afwijkingen. Gezien deze studie en eerdere dierexperimentele studies met IORT lijkt dit diermodel geschikt voor vertaling naar de klinische situatie. De incidentie van het colorectale carcinoom neemt nog steeds toe. Ongeveer 50-70% van de patiënten worden na primaire resectie van het carcinoom geconfronteerd met of een lokaal recidief of metastasen naar de lever of de longen. Voor de behandeling van lokale recidieven wordt IORT in combinatie met chirurgische resectie al langdurig klinisch toegepast in gerandomiseerde studies met gunstige resultaten. Het gunstige effect van toepassing van IORT voor andere maligniteiten zoals pancreascarcinoom en maagcarcinoom is voor wat betreft de overleving nog steeds onvoldoende aangetoond, ook al is er een verbeterde locoregionale tumorcontrole vastgesteld. Het gebrek aan adequate studies is hier mede debet aan. Mogelijkheden voor de toepassing van IORT lijken nu weggelegd in het kader van de mammasparende behandeling van het mammacarcinoom. De toekomstige behandeling hiervan zou wel eens kunnen bestaan uit lumpectomie en schildwachtklierrbiopsie, gevolgd door intraoperatieve bestraling van de biopsieholte zonder aanvullende bestraling van de mamma. Lokale behandeling van levermetastasen lijkt geen oplossing te zijn voor een hematogeen gedissemineerde ziekte. Slechts 30% van de patiënten met colorectale metastasen naar de lever komt in aanmerking voor resectie. Het hoge recidiefpercentage in en buiten de lever maakt aanvullende behandeling noodzakelijk. Zowel systemische als regionale chemotherapie heeft slechts palliatieve waarde of een gering voordelig effect in combinatie met chirurgie. Nieuwe lokale en systemische behandelingen zijn in ontwikkeling. Eén daarvan is de zogenaamde “targeted therapy”, een combinatiebehandeling met een antilichaam tegen epidermal growth factor-receptor (EGF-R, cetuximab) en tegen de vascular endothelial growth factor (VEGF, bevacizumab), beiden in combinatie met chemotherapie. Daarnaast zullen farmacogenetica in belangrijke mate een bijdrage gaan leveren aan de selectie van patiënten voor chemotherapie. Nieuwe uitwendige bestralingstechnieken met een preciezere lokalisering van de afgeleverde dosis verkleinen de kans op schade aan gezonde weefsels. Cryochirurgie van levermetastasen heeft niet het gewenste resultaat opgeleverd. Radiofrequente ablatie lijkt veelbelovend doch is tot dusver voornamelijk waardevol gebleken als lokale (palliatieve) behandeling bij inoperabiliteit van de metastasen. Chirurgische verwijdering van levermetastasen, met of zonder radiofrequente ablatie, in geval van marginale resectie gecombineerd met “precieze” radiotherapie en de toepassing van nieuwe regionale of systemische chemotherapeutische behandelingen zal van invloed zijn op de uitkomst van de ziekte. Het uiteindelijke doel van de gecombineerde behandeling in het gevecht tegen naar de lever uitgezaaide darmkanker is het verminderen van zowel het lokale recidief als de uitzaaiingen en derhalve het verbeteren van de ziektevrije en algehele overleving.